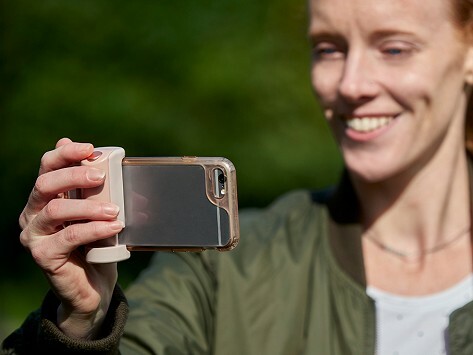 The ShutterGrip Bluetooth Remote Shutter and Camera Grip from Just Mobile makes your phone feel more like a real camera. The comfortable-in-hand, non-slip ergonomic grip fits on most phones (even with a case on) to give it that camera-like feel. This helps you take better shots and avoid phone fumbles or awkward angles. It can also work with a tripod. Use the Bluetooth remote shutter to set up and take pictures or videos from up to 30 feet away. Dimensions: 1.6" x 1.1" x 2.8"
The ergonomic grip fits on most smartphones (even with a case) so you can hold on—and frame up shots—better and to help eliminate awkward finagling or potential fumbles. You can also set it up on a tripod if you want to take videos and avoid shakiness. Want to get everyone in the frame? Capture big group shots and landscapes from up to 30 feet away with the removable Bluetooth remote shutter. With this tool, selfies, travel pics, and any other shots you take are firmly in hand.